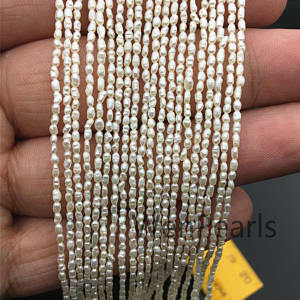 While not a true mineral due to their organic origin, pearls are globular cysts of calcium carbonate (mainly aragonite or a mixture of aragonite and calcite) that form within the tissues of molluscs as a protective coating (known as nacre) as a result of an internal irritation, such as a grain of sand. Most pearls on the market today don't occur naturally but are cultured by inserting an artificial irritant into the mollusc shell to create the pearl. Cultured pearls and natural pearls can be distinguished from imitation pearls by a very simple test. Take the pearl and rub it (gently!) against the edge of a tooth. 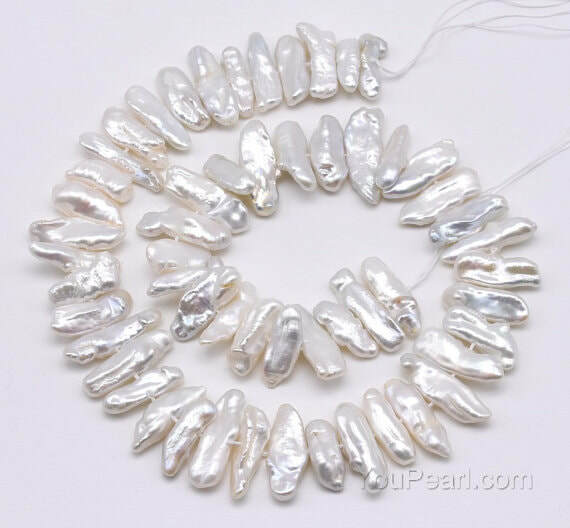 Cultured and natural pearls will feel slightly rough, like fine sandpaper, because of the texture of natural nacre. Imitations will feel as smooth as glass because the surface is moulded or painted on a smooth bead. Cultured pearls come in many shapes and colours. 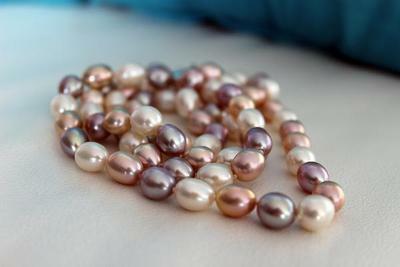 The most popular pearls are a soft iridescent white with hints of pink or grey, or iridescent black with tones of green blue or violet. 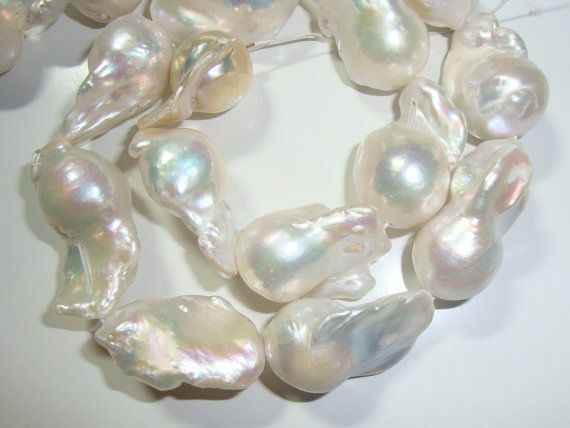 Some of the common shapes of pearls are round, baroque (irregular), oval or rice, button (flat on one side), keishi (freeform), and freshwater biwa or stick. Pearls are an enduring staple of jewellery design. Occurrences: Australia, China, Japan, the Philippines, Sri Lanka, Asia, Indonesia, Mexico, New Zealand and the USA. Mother of pearl is the iridescent coating of the inside of the pearl oyster shell (soft iridescence) and abalone shell (soft and high iridescence). It has a very distinct multi-coloured shine and a faint glow. Abalone (from Spanish abulón) are small to very large-sized edible sea snails, marine gastropod mollusks in the family Haliotidae and the genus Haliotis. 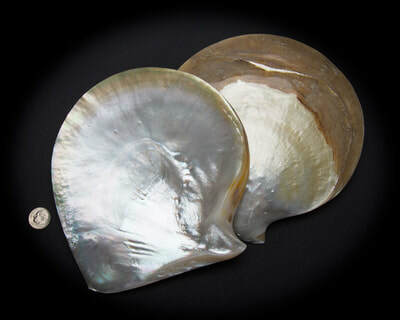 Common names for abalones also include ear-shells, sea ears, as well as muttonfish or muttonshells in Australia, ormer in Great Britain, perlemoen and venus's-ears in South Africa and pāua in New Zealand. The family Haliotidae contains only one genus, Haliotis. That genus contains about four to seven subgenera. The number of species recognized worldwide is about 100. The shells of abalones have a low and open spiral structure, and are characterised by several open respiratory pores in a row near the shell's outer edge. 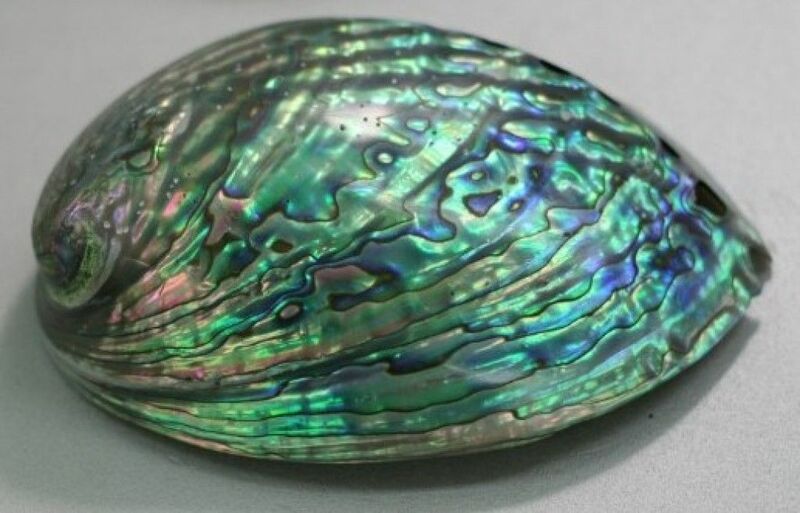 The thick inner layer of the shell is composed of nacre or mother-of-pearl, which in many species is highly iridescent, giving rise to a range of strong and changeable colours, which make the shells attractive to people as decorative objects and jewellery. It is beneficial for lung diseases such as tuberculosis, asthma, chronic bronchitis. It facilitates the healing of the heart, kidneys, urinary system and liver. 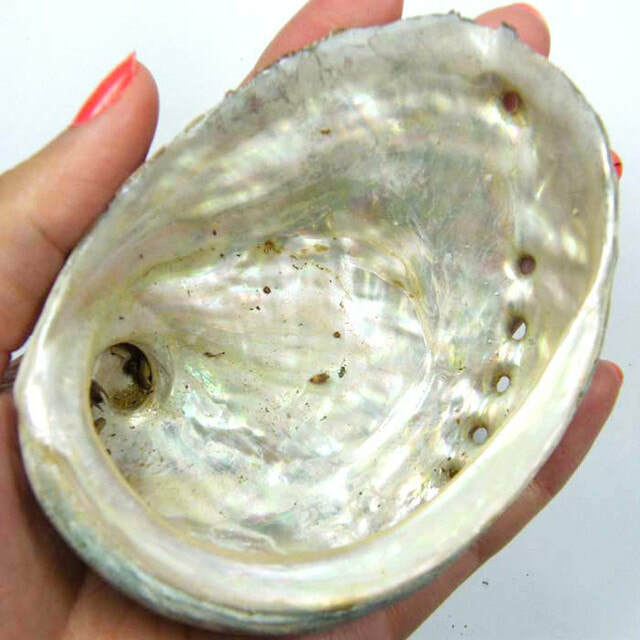 Pearl possesses a sedative and also laxative effect, neutralises poison, lowers acidity. They have been used to treat simple eye ailments, bleeding, fever and indigestion. In fact, the pearl is effective in controlling the skin conditions rosacea and acne. It strengthens the adrenal glands, the spleen and muscle tissue. It can lessen hypertension, headaches, and exhaustion. Pearls also help to reduce allergies. They help in the treatment of stomach aches, bronchitis, colds and lung infections. Pearls aid in fertility, as well as in easing the discomforts of the birthing process. As these stones are both cooling and soothing they are recommended for women experiencing a difficult time during their pregnancy. ​This stone, if used on the base and heart chakras, will stimulate the heart, and benefit the immune system. They promote, sound sleep, prevent nerve disorders and nerve weakness, and can be used to prevent and overcome fatigue. 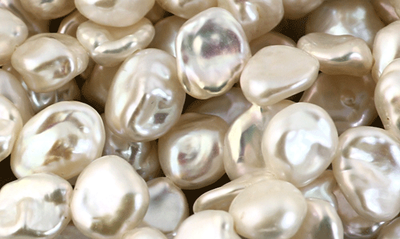 Pearls promote the regeneration of new cells and make the skin smooth fine, elastic and healthy. Pearls help to balance the human body’s natural rhythms and hormone levels with the lunar cycles. This stone will bring you inner wisdom and help to strengthen and nurture the growth of pure love. It will teach you to open up and find the meaning and the purpose of your “true self.” They enlighten the mind and inspire the mood, while helping you to learn to love yourself more and, in turn, love others more, as well. Pearl enhances feelings of good will and positive, uplifting feelings. ​These stones when worn or carried, spread loving vibrations. Wear pearls as an insurance for a happy marriage. 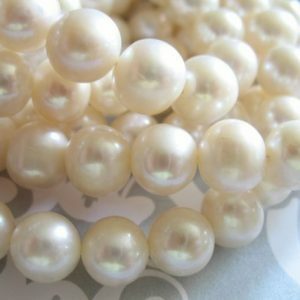 ​Pearls and relieve uneasiness, nervousness, anxiety and tension. They also have a positive effect on people who are inclined to hold in their emotions. These Moon and Water ruled stones enhance sincerely, truth and loyalty. Pearls bring centring and a calming reflection, as well as attune you to the ebb and flow of life. They promote faith, honesty, purity, wisdom, charity and personal integrity. Pearls soothe and heal the negativity and struggle that occurs in your life be it occasionally or for a long period of time. ​During meditation this stone will encourage money to flow into your life, and see yourself using it wisely. Money is energy and squandering it leaves you little in return. Pearls will assist you in manifesting what you need at that time and place. ​Pearls have water and lunar energy. As they easily absorb both positive and negative thoughts and emotions they need to be cleaned and recharged often, as they will hold the energy indefinitely. Place them in moonlight to recharge these crystals. Spiritually pearl soothes and heals the negativity and struggle in your life, by surrounding negative energy with Divine Light. This stone will dissolve any negative energy sent to you by psychic attacks and repels psychic vampires. It moves negative attachments out of your aura then fills your aura with healing light. Abalones are marine snails and are part of the large class Gastropoda. 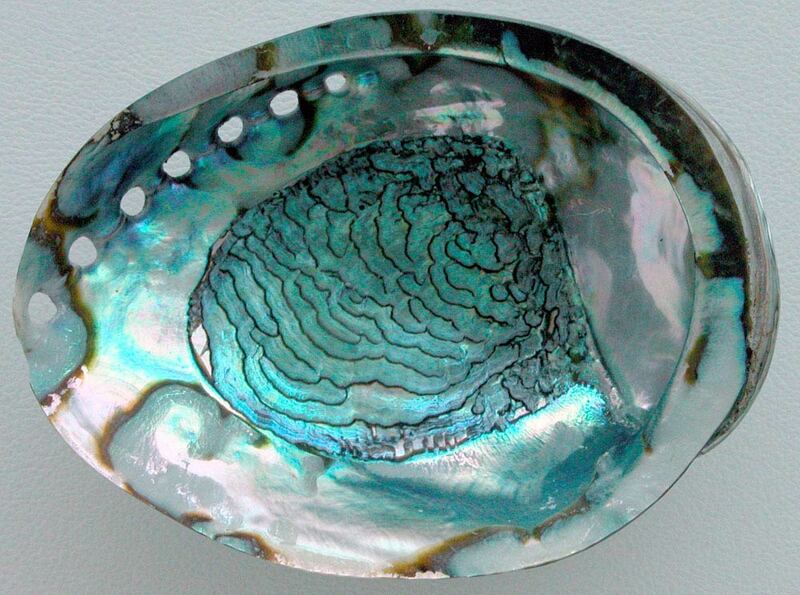 The colours in the abalone shell are more vibrant than in the oyster shell. Abalone shell opens the third eye chakra. It stimulates psychic opening, psychic vision, clairvoyance, and inner knowledge. It facilitates confidence that you are walking the correct life path. Abalone shell will help you believe in and trust your psychic abilities. This stone will help you with distance healing. Abalone shell helps to create your own reality through visualisation. ​This shell will help build and maintain muscle tissue. This stone heals the body of stress related diseases. The shells oval shape and iridescent interior have been used for rituals and prayer. This shell will bring true love into your life. Abalone shell is very protective as it repels negativity both from yourself and others. ​Abalone shell assists you in working through emotional issues that are holding onto you from the past and new ones being created in the present. This stone will pierce through your anger issues and highlight the cause so that you are able to remove the cause that stops you progressing to a calm and happy place in your life.